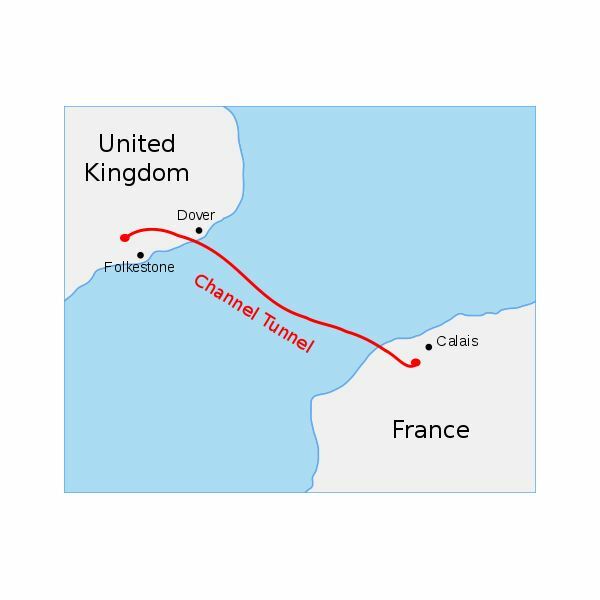 Started in 1987 and completed in 1994, the Euro Tunnel, which is also called the Channel Tunnel, or more popularly, the Chunnel, is one of the most challenging civil engineering projects of the 20th century. The Euro Tunnel connects the U.K. and France with a capacity of 600 trains each way per day. The length of the tunnel is 50 km, including 39 km of which is underwater. The structure consists of two railway tunnels and a service tunnel. The diameter of the rail tunnels is 7.6 m, while the diameter of the central tunnel that is used for ventilation and maintenance is 4.8 m. There are numerous intersecting passageways that permit trains to change from one track to another. The average depth of the tunnels underneath the sea-bed is approximately 45 m.
The geological profile and topography of the tunnel area around was studied to determine the most suitable rock layers, and also to ensure that no major geological hazard existed along the tunnel path. The studies revealed the characteristics of the rocks and the precise location of the fault zones in the region. Geological samples established that the mining conditions were perfect for the project. The top and middle layers were unsuitable for digging due to the high levels of porosity, through which water could easily penetrate. Furthermore, the upper layers contained sand and gravel that made drilling difficult. Underneath these layers was the layer of chalk composed mostly of clay. The clay functioned as an obstruction through which water could not cross. The detailed survey allowed for a suitable selection of equipment, techniques for excavation, ground assistance, and the reduction of unforeseen risks. To further minimize these risks, the vertical and horizontal alignments were optimized to make the best use of the water and ground conditions. Eleven tunnel boring machines were used that dug the Euro Tunnel at the rate of 250 feet a day. The tunnel boring machines are like large cylinders with a length of two football fields. The cutters of the tunnel boring machines that are fixed at the front side of the machine have tungsten teeth. The crushed material created by digging is carried out by conveyor belts, through the back of the tunnel boring machines. The total amount of dirt and debree that was removed from the tunnel exceeded eight million cubic meters! On the British side, an enclosed seawall was built for the storage of the loose sediments. On the French end, water was mixed with the soil and the mixture was pumped outside. The Channel Tunnel was funded by a group of financiers and cost them approximately $13 billion. Since the Channel was the first of its sort in the transport industry, it required a detailed study to achieve essential safety requirements. A detailed qualitative and a quantitative analysis, involving experts from all fields, were carried out regarding the complete project. The studies involved tests on fire detection equipment, smoke control, evacuation procedures, and several other systems involved in the venture. Multiple communication systems were installed for contact between the railway control center and the trains, and between the passengers and the shuttle crew. All the systems were thoroughly integrated, and checked for effectiveness. Communications are an important safety characteristic when operating under such unique conditions. In 1996, one train going towards France caught fire and the accident inflicted heavy damage to the services of the tunnel. About 500 meters of the track had to be replaced. In 2008, another fire accident occurred, costing 60 million pounds to repair the tunnel. It remained closed for quite some time and safety features of the tunnel were criticized by people all over the world. These two accidents forced the authorities on both sides to improve their safety arrangements. Flood prevention systems are installed in and outside the tunnel, quick water drainage ensures uninterrupted transportation. Remotely controlled pressurized butterfly valves link the two running tunnels with each other ensuring safe passage and avoid risks of closing down. The service tunnel supports normal ventilation system, which ensures normal air pressure in the running tunnel. The traction system is divided into sections of 1,500 meters in length, which can be remotely switched to isolate failed sections and ensure uninterrupted services. Fire Equipment Management Centers (FEMC) are managed by both the countries on both sides of the tunnel to keep a check on fire hazards.